About: 100 Barclay features 156 homes with views from the Hudson River to the Midtown city skyline. With over 40,000 square feet of amenity spaces, the Art-Deco tower offers an unmatched amenity program that includes: 24-hour doorman and concierge, fitness center designed by The Wright Fit, an 82-foot lap pool with adjacent wading pool, spa and treatment rooms, billiards room, a club lounge with bar and dining area, four outdoor terraces, kid’s playroom, game room, media lounge, wine tasting room and music practice rooms. Bicycle storage, wine storage and private storage are also available. Spanning 2,063 square feet, residence 11Q has three bedrooms and three and a half bathrooms. The pad offers a 460 square foot terrance that wraps the corner of the residence and has views of the Hudson River. The expansive great room, which boasts 10 foot high ceilings, is filled with light through beautiful 7 foot casement windows. The open concept kitchen features custom cabinetry and hardware with Calacatta Gold marble countertops and backsplash, including an island with seating for five, and is fully equipped with state-of-the-art appliances by Sub-Zero, Wolf and Miele. The master suite features a spacious walk-in closet and a luxurious bathroom with radiant heated Calacatta Gold marble floors. About: Unique, charming house has true character. Known by some as the oldest house in Sag Harbor, It was originally built in 1693 in Sagaponack and moved a few times before finally settling on Sag Harbor Village's Historic Union Street; mere blocks from village shops, the Jitney, top restaurants, the renowned American Hotel, the Bay Street Theatre, Long Wharf, and the sandy enjoyment of Sag Harbor Bay beaches. 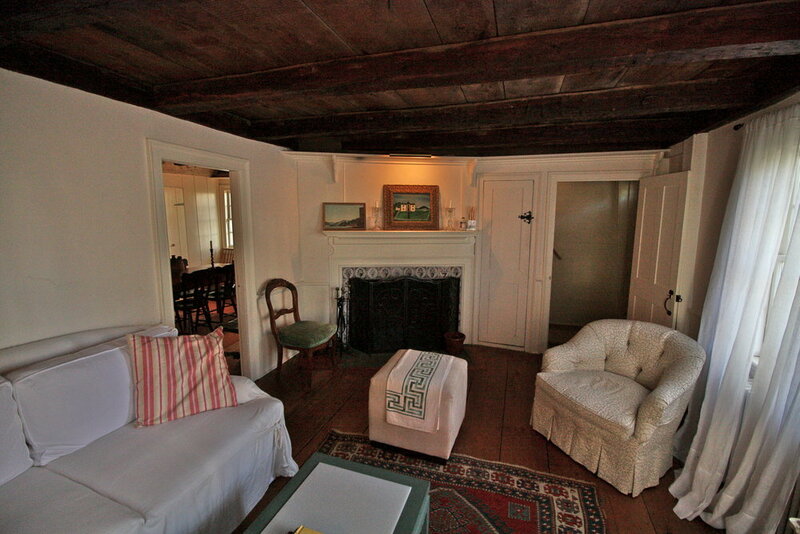 The cozy living room and dining room are the core of the original structure; featuring original exposed beams and wide wood plank floors and walls. Two working fireplaces add charm and ambiance. The spacious upstairs master suite features a dormer. The kitchen was modified with new cabinets, counter tops, and appliances including washer dryer. There are two bedrooms and two full baths in the main house, plus a large separate cottage studio with full bath, radiant heat in floors, and plenty of space for entertaining, Art Studio, or Office. The large magical garden rimmed with shade trees is ideal for al Fresco entertainment. Room for a Pool. Outstanding location in the village. About: Residence 52E is listed for $1,595,000 and this efficiently designed studio features floor-to-ceiling windows offering panoramic views of downtown New York's iconic architecture and stunning water views. Kitchens feature white lacquer cabinets, waterfall-edge countertops and backsplash crafted from richly veined white Calacatta marble and bathrooms are highlighted by custom Jamie Drake signature faucets and hardware. Residents also have access to 44,000 square feet of amenities, including the City’s first-ever Dog Spa and regulation-size double height basketball court, private resident-only Equinox and indoor swimming pool among many others. Corcoran Sunshine Development Marketing oversees all marketing and sales efforts.